If you are looking for a credit class for this summer, Serena Barton is teaching "Women, Creativity, and Healing" again through the Portland State University Women's Studies department. This class has been popular and there are still a few slots open. The class starts next week! If any readers are currently PSU students, I'm looking for you! I am scheduled to teach my four credit class, "Women, Creativity, and Healing", this summer term on the main campus. The class covers many women, famous and not-famous, who have used their creativity to heal themselves and their communities. 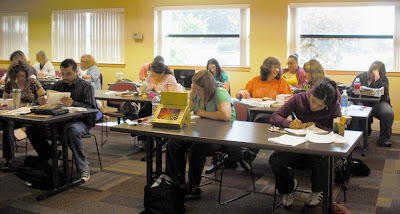 You'll make an altered book, have spirited discussions, and explore your own creativity. This is a great class to teach and to be part of. Feel free to contact me (Serena) with any questions. The class meets Tuesdays and Thursdays in Cramer Hall from 4:30-7. Register online at the PSU website.